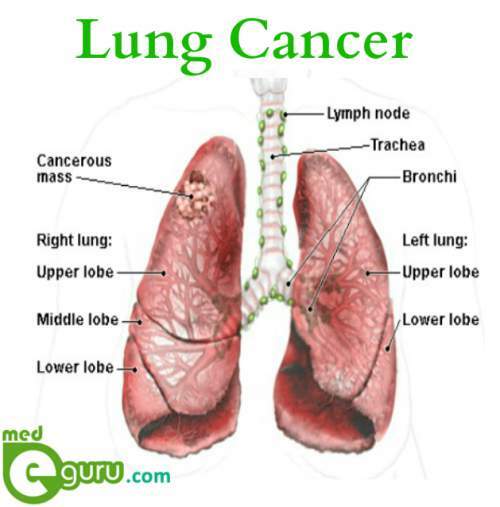 A kind of cancer that develops in the lungs is called ‘ lung cancer ‘. The lungs are a pair of spongy organs on either side of the chest. They help to take in oxygen and release carbon dioxide when you inhale and exhale. Lung cancer is considered as one of the leading causes for death in many countries. Smoking is a dangerous habit that leads to lung cancer in people. However, lung cancer is preventable. Quitting smoking can significantly reduce the risk for developing lung cancer. If one notices any of the above-mentioned symptoms, take an appointment with the doctor. Majority of the lung cancer cases are caused due to smoking. People who are exposed to secondhand smoke are also prone to develop lung cancer. According to medical experts, cancer-causing substances in the cigarette damage the cells inside the lungs. Prolonged exposure causes severe damage, and thereby results in lung cancer. Small cell lung cancer: Usually, it is seen among heavy smokers and is less common. Non-small cell lung cancer: Various types of lung cancers that behave in the similar way are collectively known as non-small cells lung cancer. It includes cancers like adenocarcinoma lung cancer, squamous cell carcinoma, and large cell carcinoma. Stage I: Cancer is not spread to the lymph nodes and limited only to the lungs. Stage II: The tumor may grow during this stage. Cancer may also spread to the lungs. Stage III: The tumor may grow very large. It will even invade the organs near the lungs. Stage IV: Cancer may spread beyond the lung and other areas of the body. What are the Lung cancer treatment options? Chemotherapy: Drugs are used to kill chemotherapy. Radiation therapy: High-powered energy beams are used to kill the cancer cells. Targeted drug therapy: Targets specific anomalies in cancer cells.